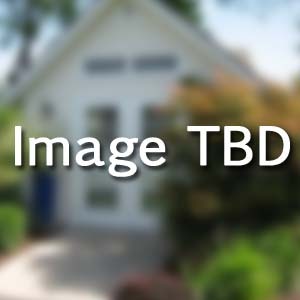 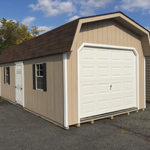 We offer a full line of garage packages available in both painted T-111 and maintenance free vinyl siding. 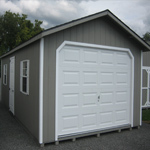 All garages come standard with reinforced wood floors, but can also be built and delivered intact without a floor. 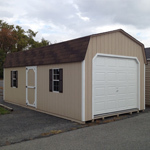 All packages include an aluminum ridge vent, side door, steel garage door, and windows with shutters. 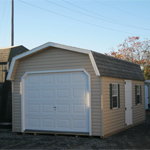 They also come fully backed with our 5 year structural warranty. 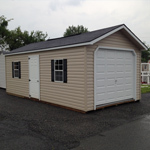 Our one car garages can be built as small as 10x16 and in two foot increments up to 14x40. 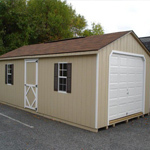 Other sizes are available to be built on site.